Place saltfish in water. Soak overnight in the fridge and pull apart the next morning. Place a medium sauté pan over medium-high heat. When heated, add the coconut oil allspice berry, thyme and garlic. Cook until the garlic starts turning golden brown and then add the onion. Cook until the onion is translucent. At that point, add the peppers and sauté just until they start getting soft. Add the coconut milk, all the tomato, saltfish, Scotch bonnet and turn the heat down to medium and cook for 10 more minutes. Season with salt and pepper to taste. If you like it spicy, chop up the Scotch bonnet pepper. 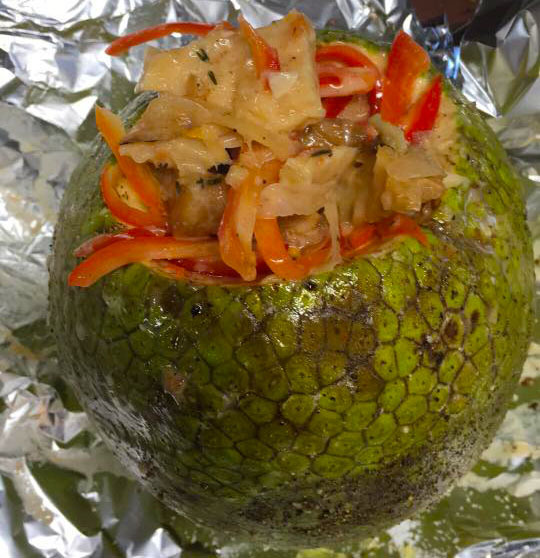 Next, cut the core out of the breadfruit and rub the inside of the breadfruit with softened butter. Season with salt and pepper. Use about 1/4 of the rundown to stuff the breadfruit. Wrap it in foil and roast until done (about 1 hour). Serve with the remaining saltfish rundown.